A Catholic church was founded in Wedgwood in 1929 by the Jesuits of Seattle University. They bought a forty-acre tract of land with the intention of moving Seattle University to the site, but only one month after the land purchase, the stock market crash of October 1929 set off the economic crisis called the Great Depression, and the university’s moving plans never went forward. Mr. Thorpe’s log cabin became the Chapel of St. Ignatius in November 1929. The small room on the left was added for use of the priest to rest and change clothes after travelling out from Seattle University. 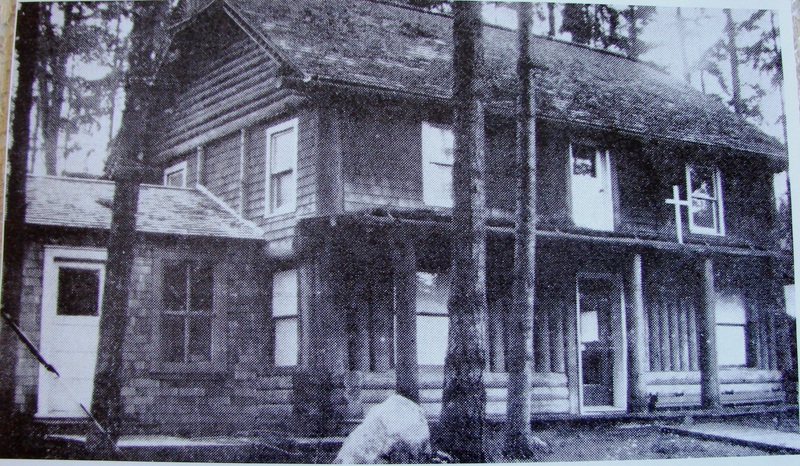 Mr. Thorpe’s log cabin was located at about NE 81st Street, just west of 35th Ave NE, and after purchase by the Jesuits the cabin was used as a chapel. It was named St. Ignatius, both for an early Christian martyr and as a reminder of the founder of the Jesuits, St. Ignatius Loyola. The first Mass in the St. Ignatius chapel was offered on November 24, 1929. An altar had been built in the chapel and eight pews installed for seating which was meant to accommodate about fifty people, but 128 people came to attend the first Mass. Some knelt for prayer outside on the porch or on the wooden boardwalk. Because of the growing number of Catholic families residing in the Wedgwood area, it was hoped that a parish would be formed and a new church built, but this was not to be. The Great Depression years from 1929 to 1940 brought economic hardship and the inability to build a bigger facility for St. Ignatius. There was no resident pastor. The founding pastor, Jesuit Father Robert V. Burns, and Father John Hayes who served from 1931 to 1939, lived at Seattle University where they had teaching responsibilities, and they filled in at St. Ignatius on weekends. A dedicated group of women formed the first Altar Society of St. Ignatius. They were responsible for cleaning the building, care of the altar linens and storing of the sacred vessels used at Mass. They organized church dinners and socials and offered meals in their homes to the pastor after his long trip from Seattle University (east of downtown) out to visit the St. Ignatius chapel in north Seattle each week. A young man, Henry J. Boudreau, was given the responsibility of arriving early on Sunday mornings to open the building and get ready for Mass. He would come carrying his ax to chop wood and start a fire in the pot-bellied stove which warmed the log cabin. 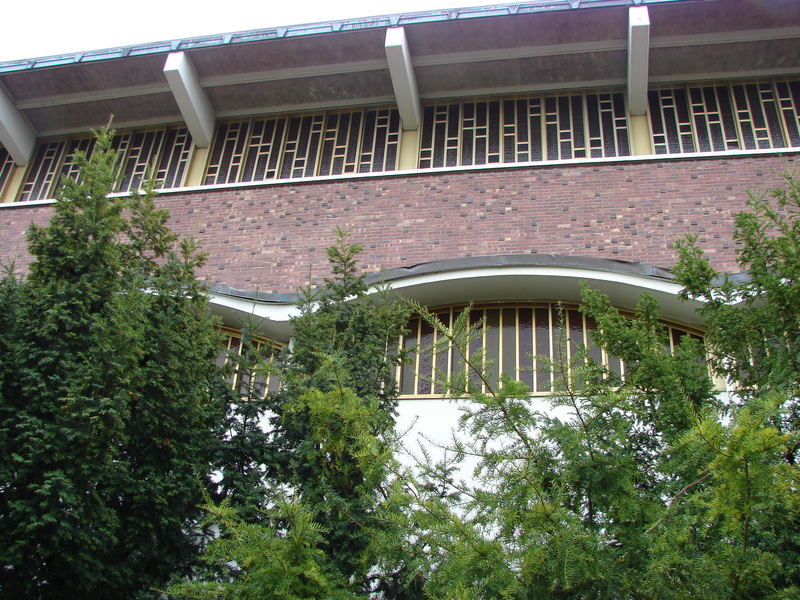 The first Our Lady of the Lake church building at 8900 35th Ave NE, completed in 1941, was this small brick structure designed by architect Paul Thiry. Image courtesy of the Seattle Historical Photographs Collection, #18245, Seattle Room, Central (downtown) Seattle Public Library. By 1940 the Jesuits had decided not to move Seattle University, and they sold the St. Ignatius property to Albert Balch, the developer who turned the site into the first (original) Wedgwood housing tract. Shortly after the sale of the St. Ignatius/log cabin church property at NE 81st Street, Father Hugh Gallagher was appointed as the parish’s first resident pastor. Father Gallagher’s first task was to find a new site and build a church building. The parish purchased property just a few blocks away, on 35th Ave NE at NE 89th Street, and within a very short time a small new brick church, designed by architect Paul Thiry, was ready for use. Because the church was now a Dominican parish rather than Jesuit, and because the church had moved to a new site, a name change was required. It was at a meeting of the Altar Society that the name “Our Lady of the Lake,” a reference to the beauty of Lake Washington, was first suggested. Father Gallagher especially liked the suggestion because his home church in Cleveland, Ohio, was also called Our Lady of the Lake. The new church with its new name was dedicated in February 1941. The present Our Lady of the Lake church is the second building to be built on the same site. The 1940s and 1950s were called the Baby Boom years because many couples married and started families after the close of World War Two in 1945. There was a housing boom to accommodate families in north Seattle, with schools and churches expanding accordingly. 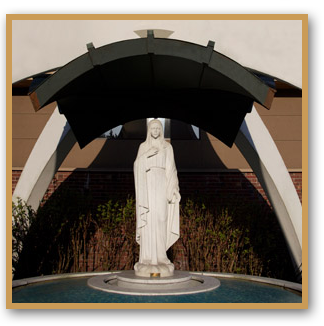 Our Lady of the Lake at 8900 35th Ave NE added a school building and a convent for the faculty of Dominican Sisters. By the peak year of 1957, five Masses were being held in the 350-seat church, with a total attendance of more than 3,000. The first Our Lady of the Lake church had been built in 1941, prior to the start of World War Two. The post-war rapid population growth in north Seattle/Wedgwood area had not been anticipated, as Wedgwood was not even within the Seattle City Limits at that time. By the end of the 1950s Our Lady at the Lake was bursting at the seams, and a larger building was needed. In 1960 the decision was made to tear down the small church which had been designed by Paul Thiry and rebuild on the same site, with a plan by a different architect for a bigger building. The architect chosen for the new, larger building was Roger J. Gotteland (1914-1999), a naturalized French immigrant who was himself a Catholic. Gotteland had worked in the Seattle office of architects Paul Thiry and Alban Shay from 1936 to 1940. Born in Paris, Gotteland spent sixty-five years of his life in Seattle where he represented France as a volunteer consul, in addition to his architectural work. The second Our Lady of the Lake Catholic Church building at 8900 35th Ave NE, designed by Roger J. Gotteland and completed in 1961, has a distinctive bell tower and white marble statue of Mary over a reflective pool, the Lady of the Lake. Biographies of architects: Docomomo WEWA. Our Lady of the Lake Seattle historical records. 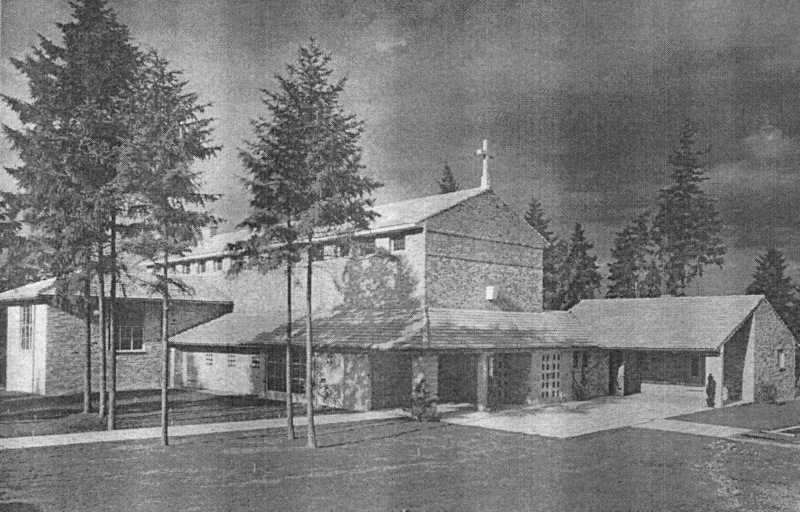 Photos of the original 1941 Our Lady of the Lake church building, designed by Paul Thiry, will soon become accessible through the Seattle Historical Photographs Collection of the Seattle Public Library. This entry was posted in Architecture, churches, ginseng farm and tagged 8900 35th Avenue NE, Catholic chapel, parish in Wedgwood, Seattle, Seattle University. Bookmark the permalink.